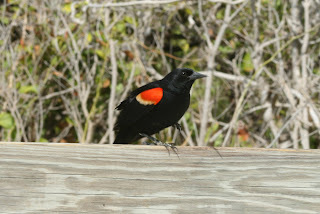 This redwing blackbird stayed by our site the whole trip. I would feed him cereal and bread. He would sit and wait for me to go get something for him. This dragonfly was taken in the Everglades. I love to look at their huge eyes. They are beautiful creatures. This picture was taken from the beach by our camp site. This is the opposite view of the island that I posted yesterday. Yesterday, I was on top of the bridge looking to where I am standing in this picture. The first part of the bridge is what was made into a viewing site.